Press Release 01.08.2019 Boca Raton Florida USA, Beijing China. VERITY International, Ltd. has recently engaged in an agreement with EPEM (1) for an exclusive provision and Agreement (2) to validate and provide custom Made in USA Certified® and Product of USA Certified® Country of Origin Labeling “COOL“ Claims for US-made products and services through industry-leading verification and validation services regarding imports into China. Providing balance and transparency for the U.S. | China Trade deficit both Presidents U.S. Donald Trump and China Xi Jinping are working to narrow. The Advanced Technology from this the Joint Venture will be to provide COOL verification for both import and export from the Chinese market for complete transparency using Internet of Things (IoT), Blockchain and Artificial Intelligence (AI). (1) EPEM is a wholly owned subsidiary of the Chinese Government Commercial Network Construction and Development Center. (2) Agreement is exclusive for verification and validation services for the official “Made in China Certified™” claim to increase the perceived quality and brand of Chinese products in the international market. Verity International Ltd. has executed a Monumental Strategic Partnership Agreement with China-based EPEM Electronic Technology Co., Ltd, (EPEM). EPEM is a subsidiary of the Chinese Government Commercial Network Construction and Development Center. This Agreement is exclusive for verification and validation services for the official “Made in China Certified” claim to increase the perceived quality and brand of Chinese products in the international market. Included in this agreement VERITY has an exclusive provision to provide all Country of Origin COOL verification and validation services regarding imports into China with “Made in USA and Product of USA Certified” claims, to help balance out and provide transparency for the U.S. | China Trade deficit and all COOL claims examples: Made in Canada, Made in Australia, Made in Italy and many more, for import into the Chinese market to provide product transparency using Internet of Things (IoT), Blockchain and Artificial Intelligence (AI). On April 18th, 2017, President Donald Trump signed Executive Order #13788 into effect reinforcing the Buy American Act and requiring the US government to start implementing more ‘Buy American and Hire American’ policies with additional scrutiny. This not only affects manufacturers/vendors that sell to the US government, but also farmers that supply produce to school districts, government facilities, and more. More specifically, the USDA’s School Lunch program must now comply with the recently signed EO by discontinuing waivers and preferring procurement from US Farmers. With EO #13788 following its scheduled timeline, there is increasing pressure for the U.S. Government to implement more scrutinized procurement policies regarding the Buy American Act (BAA). Luckily, there is an easy solution for farmers to proactively meet and exceed increased procurement regulations. While the Trump administration prepares to renegotiate the North American Free Trade Agreement (NAFTA), U.S. Sen. Pat Roberts (R-Kan.), chairman of the Senate Agriculture Committee, is warning against any reconsideration of country-of-origin labeling (COOL). COOL is reportedly among the administration’s “key elements of a model trade agreement” that it aims to address in renegotiating NAFTA and other trade deals. But in a committee hearing last week Roberts told Robert Lighthizer, Trump’s nominee for U.S. Trade Representative ambassador, to scrap that idea. Brasília (AFP) – The fallout from Brazil’s rotten meat scandal accelerated on Monday when China, a huge client, suspended imports and the European Union demanded a partial ban. Another ban on Brazilian meat imposed by Chile sparked fears of a trade spat between the two South American partners. A charm offensive by President Michel Temer, who even invited foreign ambassadors to a traditional meat restaurant in the capital Brasilia late Sunday, failed to calm importers. China, which with Hong Kong is Brazil’s biggest meat export market, said it needed to know more about the allegations that major meatpacking businesses bribed inspectors to get health certificates and masked tainted meat as fit for consumption. 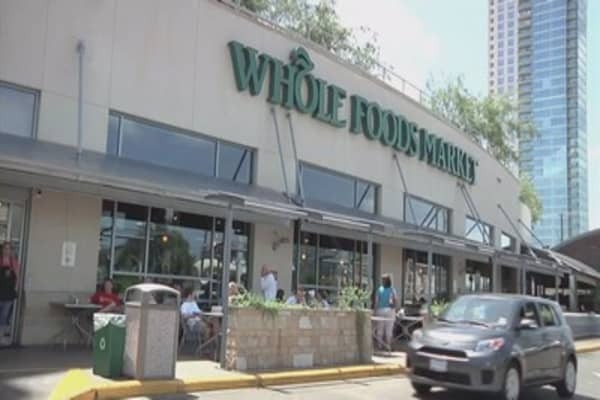 Whole Foods Market said Wednesday it will close nine stores in the second quarter as it abandons its goal to open 1,200-plus stores. “We’re going to continue to grow, but I think we’re going to be a more disciplined growth company than we have been in the past,” John Mackey, co-founder and CEO of Whole Foods, told analysts on the company’s first-quarter earnings call. Still, the Texas-based company also said it welcomed 14 new stores in the first quarter, including two outlet relocations. The National Organic Standards Board voted unanimously last week to update its U.S. standards to ban ingredients derived from new genetic engineering techniques from certified organic products. The vote served as a recommendation by the NOSB to the U.S. Department of Agriculture’s National Organic Program. The board says it will ensure ingredients that are derived from new GE techniques will not wind up in organic certified foods and beverages. One of the new GE methods the board is concerned about is synthetic biology, which designs and constructs new organisms to either produce something they would not normally produce or to edit DNA to stop certain traits from being expressed, according to FOE. Chinese police officers check cartons of smuggled meat seized during a raid on a boat in Shenzhen city, south China’s Guangdong province, 16 September 2016. Maritime police in southern China’s Guangdong province have seized 1,000 tonnes of smuggled meat and arrested 16 suspects during a recent raid, local authorities announced Saturday (17 September 2016). The frozen meat was found wrapped in cardboard boxes in three freezers on a boat and was worth more than 80 million yuan (11.9 million U.S. dollars), police said. The suspects were caught in waters off the coastal city of Shenzhen Thursday, according to police. The frozen meat had no quarantine certificates or legal purchase documents, and included beef, ox tripe, chicken wings, drumsticks, oxtongue and chicken feet, from the United States, Brazil and Thailand. Police in China’s southern province of Guangdong have seized $12.3 million of potentially hazardous frozen meat including some reportedly soaked in bleach. Sixteen suspects were detained in the raid late last week, say local police, who uncovered 1,000 tons meat and offal — chiefly from the U.S., Brazil and Thailand — on a vessel near Dangan Island by the city of Shenzhen. “A criminal gang that used to smuggle frozen meat products, along with marine smuggling channel in Guangdong waters, were busted in the crackdown,” said a police statement, reports the state-backed China Daily newspaper. The bust is the latest food-safety scare in China, where in recent years consumers have faced horrors such as cadmium-laced rice, fake eggs and infant formula contaminated with the toxic chemical melamine. Food safety now consistently ranks as a top concern for most Chinese, with exasperated netizens calling for tough punishments after this latest scandal, and asking why standards were not being implemented. “Could we just execute these offenders?” asked one user of China’s Twitter-like microblog Weibo. The Globe and Mail is reporting that the U.S Agriculture Department has given the Canadian Food Inspection Agency until mid-March to fix significant food safety and sanitation concerns found during an audit of Canada’s meat, poultry and egg inspection systems. CFIA met the “core criteria” for overall food inspection, but American officials identified “operation weaknesses related to government oversight, plant sanitation and microbiological testing” for listeria, salmonella and E. coli, according to a final report submitted to CFIA on Jan. 14. Failure to fix the deficiencies could lead the U.S. government to delist Canadian plants that were audited from exporting their products to the United States. CFIA issued a statement to The Globe and Mail late Monday insisting that food safety was not compromised and steps are being taken to improve the inspection system. 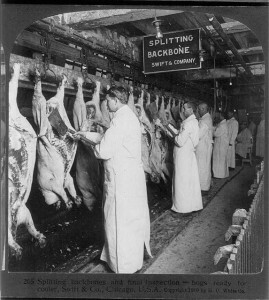 The U.S. Food Safety and Inspection Services (FSIS) conducted the audit between May 28 and June 13, 2014, of slaughter and processing plants in Ontario and Quebec. The audit found CFIA does not conduct ongoing environmental sampling and testing in food-production plants for Listeria monocytogenes (Lm), the bacteria that contaminated cold cuts produced by Maple Leaf Foods in 2008 that resulted in the death of 22 Canadians.